At Mountview, your home is your playground. The best place to experience your outdoor Mountview lifestyle is at the White Rock-Spring Mountain Conservation Estate where you can explore its numerous bushwalking trails, ranging from 200 meters to 19 km return. Some treks are especially good for horse riding and mountain biking, with plenty of wildlife to see along the way. The views from the lookouts are also magnificent, as are the well-designed picnic areas. Sports facilities for the whole family are located conveniently nearby, at the Redbank Plains Recreational Reserve. Home to the Rebels Softball and Teeball Club, also the Westminster Soccer Club, the site serves many codes. Don your sports guernsey. There are three fields for rugby, two for soccer, with an oval for AFL and softball. In the complex, there are multiple undercover picnic tables, BBQs, also walking and BMX tracks. Add to these, a skate park and even an open area dedicated to flying toy aircraft. The reserve is also where you will find the Redbank Plains Library which stages frequent events such as book readings, arts and crafts, as well as children’s entertainment. There’s also the world-class Greg Norman designed golf course, located at nearby Brookwater. Other notable leisure facilities in the area include the Redbank Sports & Recreation Centre which offers a variety of indoor games such as basketball, futsal, volleyball, touch football as well as classes in Tae Kwon Do, Karate, Taekidokai and dance fitness. The Goodna Aquatic Centre, a mere 15 minute drive away, offers an aerobics program to assist in overall fitness and well-being, as well as swimming classes. 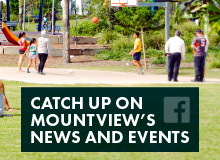 Mountview residents have access to Redbank Plains Shopping Centre. There is also the recently upgraded Redbank Plaza with Kmart, Big W, Coles, Aldi, a selection of smaller stores, as well as Reading Cinemas. Add to these, Orion Shopping Centre with 120 outlets, entertainment venues and an array of dining options. Also, let’s not forget, the proposed Mountview 6000sqm shopping precinct is coming soon! This will become the retail hub of the Mountview development, offering families convenient access to a major supermarket and a variety of other shops. Residents of Mountview have comprehensive health facilities right on their doorstep, including four medical centres in the immediate vicinity. Just 10 minutes away there is another three medical centres, with a fourth in Springfield and the Ipswich Hospital, a 15 minute drive. Moutview Community offers families access to top-class educational facilities. There are no less than 10 childcare centres, pre-schools and primary schools, four secondary colleges and the University of Southern Queensland, just 10 minutes from Redbank Plains. Add to these another 90 schools, the University of Queensland in Ipswich and two TAFE campuses close by. View Devine's Privacy Collection Statement. Photographs and images are for illustrative purposes only. Information subject to change without notice.